One could criticise Product for setting its sights too low. Hollywood – in all its gaudy, crass self-centeredness – is just too easy a target for a playwright as good as Mark Ravenhill; a writer whose dialogue is best delivered with a rapier’s thrust rather than a cudgel’s blow. But then, Hollywood being Hollywood, a complete shitball of a film like The Interview gets made (a film whose pointlessness is only equalled by its charmless offensiveness). Next thing a chain of events is set in motion that ends with news broadcasts dominated by the threat of North Korea going to war. Whether we like it or not Hollywood matters. Cultural imperialism is one of the strongest weapons in America’s arsenal. Democracy may be won on the battleground but those beloved ‘western values’ are secured elsewhere. It is in the malls, the bootleg CDs and – for many – in the cinemas, where citizens are shown worlds of freedom, choice and (of course) sweet, sweet capitalism. Increasingly as the wheel continues to turn towards the East and the world welcomes China to the consumers club, we have seen the money men of Hollywood willingly kowtow to the emerging markets as American cinema spending flatlines. As a result major blockbusters, think Mission Impossible or James Bond, have whole sequences set in Macau and Shanghai shoehorned into the action. These strands of Hollywood venality and its relationship with the rest of the world were not the issues concerning Ravenhill when he wrote Product back in 2005. Then the focus was on the media’s response to terrorist events (9/11 is the shadow that looms large in the background) and the need for easily explainable narratives to sell to the public. The problem when trying to view the play in this light is that – and it may be a question of 10 years remove – these wider themes are never really brought into the light. It seems more obviously an often witty, always filthy, satire on the self-obsession of those working in the film industry. The play wonderfully breaks down a universal tragedy and places it entirely within the context of the individual – what does it mean to the character? What does it mean to the actress playing the character and to the person pitching them the role? 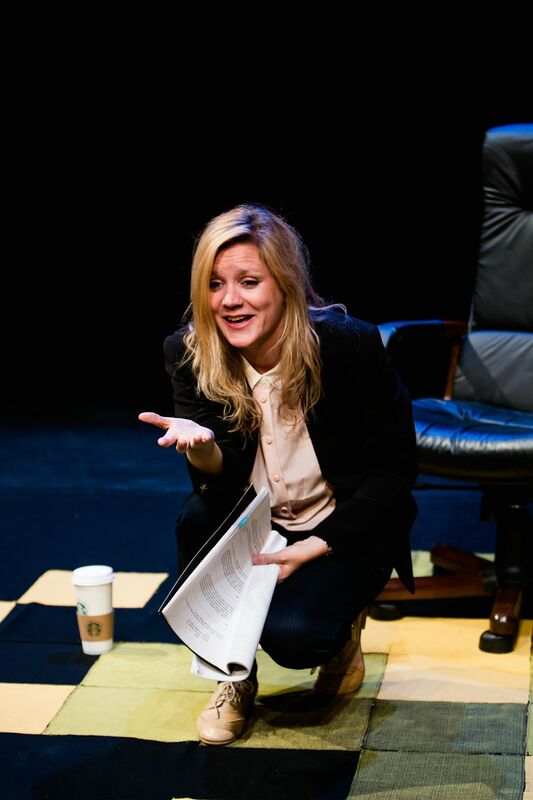 The play is strengthened immeasurably by the assured performance by Olivia Poulet. Always the character with not quite enough screen time on The Thick of It, Poulet is given room and time to develop the role. The script is so funny, and Poulet such an engaging and lively performer, that at times it has the air of a character comic rather than theatre piece. This is enhanced due to the fact that the audience effectively takes on the role of the actress being pitched to, and so Poulet talks straight to us. She is very good at flicking between the world of the film, and the abstracted commentator on the script she is describing, and by the end of the play she has conjured an entire film that the audience can believe it has really seen. One frustration is that we never get into Poulet’s character’s inner life. We don’t sense whether her character actually knows how terrible the script is. As the play continues we get an increasing sense of desperation in the pitch, and there is an increased mania in the performance as the actress begins to show her disinterest, but ultimately we are never quite sure of whether Poulet’s character recognises her own ridiculousness. I am sure the monologue would have hit harder when it was first written. Even at four years remove the events of 9/11 were still raw, and war in Afghanistan and Iraq dominated the headlines. Ten years on it may have lost some of its power but it remains worthy of revival because many of the issues that dominate this play are depressingly current. The actors maybe changing but the story has remained the same. Product is a performance piece that straddles mediums making recommendations difficult. As a piece of theatre, it is an enjoyable if lightweight evening. You won’t feel you have wasted your money but you might wonder if that is all there is. However viewed as a piece of character comedy then it may well seem highly satisfactory. Poulet undeniably creates a living character out of Ravenhill’s script and there is enough laughs in it to easily sustain its 50 minute running time.